Leave your daily worries behind. Be one with the elements around you. Relax and listen to the voice of the Mountain and welcome the rise of the sun. Breathe the beauty of the nature. A suggestive path between the alpine peaks and in yourself. Starting from the restaurant Carosello 3000 heading to Madonon, one of the most panoramic points on the entire Livigno valley. Along the path there will be small bbreaks where to practice exercises of Asana Yoga and walked meditation under the guide of the yoga instructor Laura. 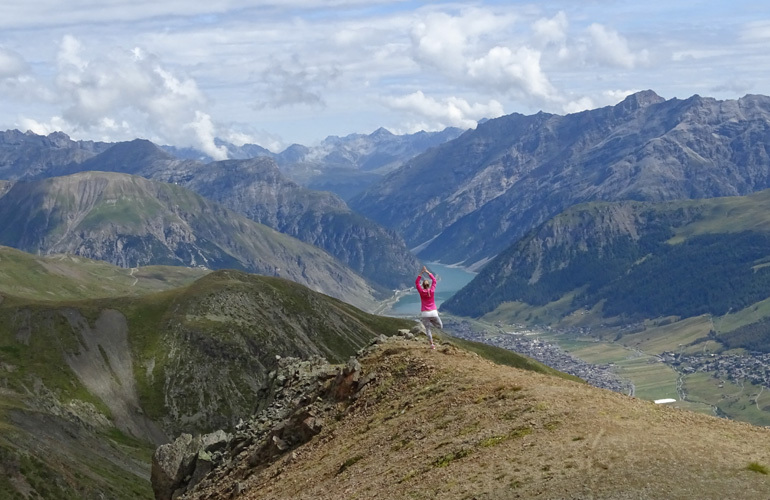 These breaks are made in suggestive locations as the alpine lake Lac Salin, a ridge viewing the Canton Valley and a flat looking the Mount Bernina. Opening of the Carosello 3000 cableway. Meeting with the Yoga instructor Laura Liduma at Carosello 3000 restaurant, mobiles deposit and start. 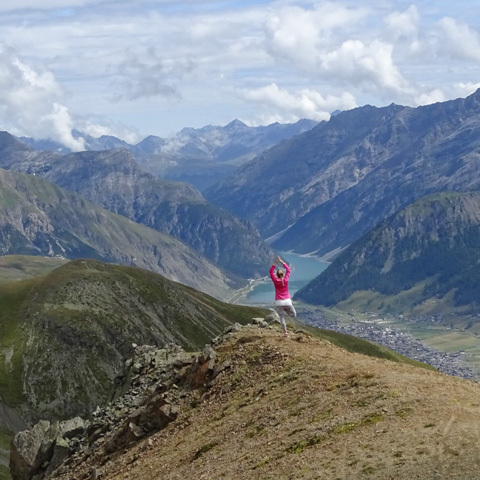 Meditative walk with Asana yoga sessions in wonderful locations during the path. Arrive at Madonon, breathe exercises and break with natural tea with local herbs. Arriving at Carosello 3000 restaurant and wellness breakfast. The price of the Yoga Experience is € 29,00. The price includes: round trip ticket on the Carosello 3000 cableway, Carosello 3000 outdoor cup, yoga lesson, herbs tea at Madonon hut, wellness breakfast. Bookings at the ticket office of Carosello 3000 in San Rocco cableway. Don’t lose time, theplaces for this experience are limited. The Yoga Experience is an exclusive event with a limited number of places. Book now to secure your place before they're all gone. Respect the wisdom and the limits of your body - Don’t push beyond the limits of your body, listen to it and respect it. Eat, drink and yoga – I suggest not to eat for one or two hours before practicing yoga and to drink only few water. Avoid alcohol, sugar and caffeine before the practice. Breathe - Yoga means finding a healthier and deeper harmony between our body and our mind, and our breathe is central in this. Yoga positions, walked meditation and the breathing go all together. Concentrate on your breath and coordinate your movements every time you inhale and exhale. The breathing helps to focus the mind and relax the body. Don’t make comparisons with the others - Look at your progresses, not to those of the others. Yoga is a non- competitive practice. Appreciate every small progress of your practice, the best part of it is in the awareness of the healing and the union of mind, body and spirit. It’s important to understand that yoga and walked meditation is a journey, not a destination. Have a sense of humor – Yoga and walked meditation are quiet and focused activities, but we shouldn’t take ourself too seriously. Umilty, a smile and some sweetness can make every practice lighter and more enjoyable. Wear comfortable clothes – You’ll stretch your body in every direction, hence don’t wear anything that might limit your movements. Take into consideration that we’ll be outside, hence bring a warmer extra jacket. Leave your mobile – Yoga and walked meditation requires to be always present in the moment and to be fully aware in every single emotion you feel. A ringing mobile phone not only distract you, buti t bothers also those around you . Be on time . The meeting point is at 6.30 a.m. at the Carosello 3000 restaurant. There is no shuttle bus running at that time, so book a taxi the evening before to come and pick you up from your hotel or apartment in the morning.